Waiting for the Nokia N97 or Palm Pre? I just realised the other day that my phone contract was up for renewal last month, and baring in mind that I have changed my phone recently to a Nokia E71, have been pondering what to do with the renewal. So I rang O2 customer services to see what sort of deals I could get and what sort of phone they would recommend based on my typical use. As normal, the first recommendation was the Blackberry, but I've never liked them. I forced myself to use the curve for a couple of months to see if was any good, and I just couldn't get used to the restrictive way it provides messaging. The thing I find with agents and phone sales is that they have it drilled into their mind that Blackberry is the only way to get instant email and is the most suited device for that, but that simply isn't the case. I'm currently using the E71, and its a better phone all round. It's more sleek, better quality and more standardised than the Blackberry. I asked about a few, like the iPhone, just to get the chance to try them out, and perhaps experiment with some developments on them. The contract arrangements mean that you can not use any other phone, and they are 24 month only contracts too. Basically if you don't like the iPhone, you are stuck for 2 years having to use the damn thing. Not appealing when there is no way to really "try" it out. After going over my options with the sales rep, I came to the conclusion that there simply isn't a phone better suited than the E71 available yet. So I'm now going to have to wait, postponing my upgrade so that I can get a heavy discount on something better that I would like to use, and I decided that I wasn't going to go for, say, a Sony X1 and making a hefty profit on it on eBay. 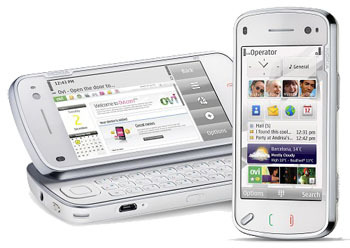 Two phones I'm eagerly awaiting for is the Palm Pre which I'm expecting to be a fantastic competitor to the iPhone, and an upgrade of my currently E71 which would be the Nokia N97. The N97 seems like a completely new breed of phone from Nokia as the interface and OS seem considerably different, but this could purely be just a facade. It's less wide than the iPhone, but very slightly longer and the sliding keyboard will mean it will feel a little chunky. One thing I like about the E71 is that its wafer thin, and tiny in it's dimensions. Slipping unnoticed into any shirt pocket. The N97 has my attention because of the massive features such as touch screen and accelerometers, huge capabilities and capacity and a new way to do developments so that it is easier to write applications for it. I just hope the size won't be a burden. This might be a straight forward rant, but I'm sure I'm not the only one to be losing out with the interest rate cuts in the UK. Interest rate is now 1%, and some of the best instant access savings accounts are around 2.4%, and fixed aren't much better. In fact some of the better rate accounts have now been frozen by banks as they have maxed out the total investment size they allow under each of the schemes. Basically the British government are trying to claw back from a deep financial crisis, but in a way that simply isn't working. What is worse is that the entire issues surrounding the mass collapse are simply because people got greedy and borrowed, and borrowed and borrowed, far more than they could afford.. So my rant is simply that all those that actually did the right thing, borrowed only when needed and amounts they could afford and subsequently paid off, or saved up for their wants and needs are now the ones that are getting fried by the government, just so those that didn't do the right thing can be "saved". In fact the amount of bankruptcies and IVAs have increased significantly over the last year, and all this falls back on the honest, "do right" men and women. This has left those that have saved to retire or those that have semi-retired, to now find it almost impossible to keep going.. Years and years of hard work, saving.. doing the right thing.. and they are better off to have splashed out and bummed their whole life, because they'll get all the government to spend the rest of the tax payers money on them instead. So what is being learnt about the whole financial crisis... nothing at all about doing the right thing, that's for sure! Key learning is how to blame storm on a massive scale and how getting into financial problems is perfectly acceptable risk as you'll just get bailed out by someone when the going gets tough. For some reason everything is blamed on the banks.. Not saying that they were involved in the whole issue, after all they were the ones handing out impossible loans, but I strongly believe the individuals and government knew exactly what they were doing, and knew what risks it was leading up to. Now the "do right" people are the ones bailing them all out. It's not exactly an inspiring set of circumstances.. Why work hard all your life to be giving what you earn to everyone else that simply get greedy and borrow, borrow borrow. I think the worse part of the entire affair is that businesses are really suffering. A lot of small business owners I speak to are still finding it impossible get any over draft or loan facilities. These people have perfect credit ratings, and there simply isn't any reason they shouldn't be able to get what they need. I don't want to beat a dead horse here, but billions of pounds going to banks to allow them to lend to businesses, at least that was the plan.. Now, this came up a few months ago.. what I find astonishing, is that nothing has changed still.. A lot of businesses can't survive without the credit. I actually can't find anything positive about the decisions made yet... All talk, all blame, no lessons learnt. The economy will eventually get back on its feet again, but I actually see a strong chance that behaviour and the risks people will take will be even worse than before. Everyone is going to be saying "don't do it" and "it shouldn't be allowed", but it's more than likely its going to, especially after all this.. I finally bit the bullet and bought a newest tablet PC. The HP TX2-1010, as it is far better value at £799 inc VAT, than of its Dell rival. This is what the resolution should be like, but HP don't want to make it that easy. Neigh, if you were to talk to a HP support staff member, they'll let you know that using any other OS would void the warranty, i.e.if you need to send it away, you have to put the crappy factory install back on, or need assistance with the support team.. which ties the average user down to a over bloated software monolith. What doesn't make sense is that HP provide "support" for 64bit operating system on their websites by providing the drivers ready to download. But I found out this is just a tease... I checked that the drivers were available before I bought the laptop, as I knew I needed the upgraded OS, but it isn't until you actually reinstall do you realise that they haven't put all the drivers, and none of the software on their website. An entire weekend, and I did find a solution. Most people I see around the web give up and revert back to the factory build, trying to uninstall all the crap that comes with that, but the recovery drive is the key. Using 7-zip file manager, you are able to get hold of all of the software and drivers under "D:\Proload\Base.WIM\1\swsetup". This means that even after you have reinstalled, the software is still there ready for you to reinstall manually. And you can pick what you really want/need versus bloating the laptop out. You will find that some of the drivers are 32bit only, however a lot do have both 32bit and 64bit available. Those that are missing can be obtained from the HP website, and I did find the 64bit drivers for the ATI graphics card from the ATI site (you need to get the ATI HD 3400 drivers which work) to be better. This only leaves one really essential part. N-Trig.. N-Trig is the manufacturer of the duo sense screen.. this screen is pretty remarkable engineering.. It is a pen, touch and multi-touch combined device that sits over the normal LCD screen. It gives a slightly grainy look, but the quality and accuracy is second to none. It even has the forward thinking to stop the hand touch technology whilst the pen is in use, allowing you to write whilst you are still got your hand resting on the screen. Those that haven't use a touch screen before may not appreciate the magnitude of something as "simple" as this, but it really does make the tablet mode effortless and natural. Ok, so I did mention a problem, and the problem is simply that the drivers that are on the recovery disk are 32bit only, and HP do not provide any drivers for the device on their website (remember this is the touch screen part of the tablet PC! essential stuff!). I was lucky enough to figure out that Dell (whom are much better at hosting software and drivers) do have a 64bit edition under their opposing Dell Lattitude XT section. These do work with the HP, however the HP version of N-Trig has the pinch to zoom and rotate gesture support which makes the device act a little like a giant iPhone. This version however I am still hammering at N-Trig to get hold off. Unfortunately I get the feeling it will be in vein based on their general responses I've seen around the web regarding support of their product. But no worries in the longer term.. The entire device support Windows 7!! Which has all the gesture and multi-touch built into the OS, and N-Trig have already released the 32bit Windows 7 drivers. I'm sure, by time Windows 7 is out (i'm guessing towards the end of this year, possibly even before with the generally good feedback it is receiving), they will have the 64 bit drivers which will put the new multi-touch laptop I now use into usability overdrive. UPDATE (7 May 2009): n-trig have now released the Windows 7 RC drivers which includes 64bit! I have not yet tried them as I'm still having difficulties getting hold of them from the n-trig website. Click here for more information about the HP TX2 tablet PC on Windows 7.